To be read in the fervent, Pentecostal lilt and rhythm, remembering that Pentecostal sermon-speak is but the distillation and co-optation of a thousand generations of heathen witch and voodoo ways turned to Southern preaching. Let us move into a strange dimension, where this witch spell-talk is turned back into the filled hofs of Frodi. God wants us to be free! Praise the Lord! The Lord wants to help us loosen all weights and chains, all manacles and bonds, all debts and worries! The Lord wants us to love freely, to feel pleasure freely, to enjoy strength and mirth and good times! Lord knows that life holds enough struggle and pain as it is that we ought share as much pleasure as we possibly can! And so when the times were dark and the monstrous were amongst us, the Lord called us into small brotherhoods to share our joy and give to each other that our needs might be met. The Lord called us together into tight bonds of frith, ousting all killers of joy, so that we might trust and love and enjoy with full im punity, and no fear of those who might attack our joy. The Lord asked us to meet in thronged frith-guilds, singing, dancing, letting hair down, letting gentle wildness loosen all bonds, 'till we were frothing, whirling, dervishing, rapturing through the streets and down the village lanes! Praise Freyr! For when we were down and out of luck, when it seemed the gods in heaven and the gods of earth had split themselves apart, when the very ogres children cringe from at night seemed to creep in from the four corners and aid the very worst of men, when the most wolfish of kings ruled us with an iron fist and a gendarme of giants, then, he, praise be to Freyr, came out from Alfheim to bring us joy. And we needed joy, yes we did, hail Atriði, for we were living in despair, and living in squalor, and the whips on our backs and the bullies amongst us had made us forget the Laws of Heimdall. Wo, alas, for those who should have been thralls were earls, and those who should have been earls were thralls, and not a freeman amongst us! Alerted by his elven vassals, he came amongst us, dressed as one of us, living in the woods, and he helped our hearts to become strong again. For many things were wrong, and we could not right them until our wrecked joy itself was righted. Hail Atriði! My brothers, my sisters, many times it seems we are back again in those faulty and dark times. Many times it seems that the chains are upon our wrists and the whips upon our backs. Many times it seems that thralls think themselves earls, and will not foster a freeman! But the worst of all, my brothers and sisters, is when we forget that we are free. When we forget that joy is our birthright. When we forget that full enjoyment of the heavens and earth, the birds and the bees, the mead and the milk, the bread and the butter, the love and the lore are ours ; and though we may live in a hovel, if we are free, we are greater than the highest of false kings! Though we may ride a shoddy horse, and carry a simple carriage, if we are free, we stand taller than the tallest giant! Though we have never received praise in the courts of the haughty earls, if we are free, our minds stretch farther than all the sages! Hail Atriði! But those who are not free, though they enjoy wealth and privilege, teach us to be ashamed of our bodies! Shame upon them! But those who are not free, though they enjoy prestige and honor, teach us to be ashamed of our celebratin' and dancin' and dervishin'! Shame upon them! But those who are not free, though they enjoy rank and collar, dare to teach us to be ashamed of our loves, however we may love? Shame upon them! A thousand shames upon such nidings! For the Lord himself once loved a love that no one dared, and lo, though she lived amongst the very outcast themselves, he sent his friend to fetch her and take her hand in marriage! For all love is holy, and only those who choose each other can judge whether the choice is right! When the miserly came into our lands and saw the freedom of our folk, wo, there was an ill envy upon them, and they would seek to snuff it out! When the miserly came upon our kings, and saw them giving away gold, wo, there was foreboding amongst them, and they would seek to separate the king from his folk! When the miserly came into our temples, and saw the glory of our Lord lusty and proud and shining for all to see with no shame but pleasure, wo, there was shame in their hearts, and they threw down our holy relics, and called them the homes of demons! But we knew what demons were like! Demons were those who invaded the land and lorded it over us! Demons were those who threw their might about and robbed us of our simple joys! Demons were those who taught us to be afraid and ashamed of our pleasures, our bodies, our very freedom. And though you may knock temples over, and knock the Lord upon the ground, praise Freyr you cannot keep him down! For Frodi rises from the tomb, a trick, you thought him dead, again and again, he rises up, and will not cease to grow! Hail Atriði! Glory be to Ingvi! 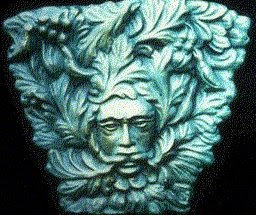 For that Green Man, though he be a corpse with his tongue wagging from his mouth, yea, the very vines and branches swirl and stretch out from his maw and grow! And through the long years those carvings stood within their churches, those aisles where they taught us shame, reminding, reminding, some day, some day he would rise again! For Freedom cannot be put down forever! Hail Atriði! Glory be to Ingvi! A thousand blessings on King Frodi! 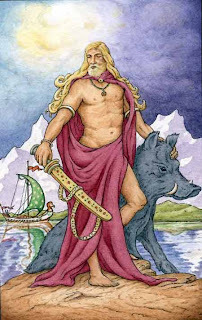 Praise Freyr and his holy wand of pleasure! Brothers and sisters, it does not matter if you are few, for the few are always more than they imagine, and better to be a few who sing and hear each other's tune than to be amongst the mass who drown out your voice and throw spears through your smiles. It was in guilds of these kinds that our numbers once grew, across the many lands, proclaiming peace on earth, goodwill towards men, and freedom for all! And with this mighty message we once, yes, we once together swarmed and overwhelmed the giants! And then we put them to work spinning that mill to mill us gold and peace! Those were the Golden Ages. Now you may say that time never happened, that it is but a story. But I say unto you, when you find your guild, and you sing your song, there the seed of those times is once again planted! And I say unto you when giants rise but the swell of liberation rises higher, yea, even unto insurrection and revolution, the joy of Freyr will not be kept down! For these tales repeat themselves a thousand times. These tales are always true, even if they never happened, for some say it was Urd herself who whispered them into Bragi's ear, when he whispered them into the ears of our ancient poets, for all these stories were the shape of how she wove the web, and with these tales, we have a key, a precious key to wyrd itself, that if we realize, if we recognize, we can unlock the locks that bind us. No, these tales are true, my friends! Look in your hearts and you will find them, pulsing! You need no blind faith for that! You need no doctrine for that! You need no shame-ridden mumbling for that! All you need do is close your eyes, and feel what it is like in your bones, your sinews, your muscles, and your blood when you feel most free, and swell that up against all that holds you back, that makes you cower, that drives you like a slave, and you will see, these words, these tales, are healing tales, tales of freedom. Praise be to Freyr! Glory be to Ingvi! And live your life with joy and freedom! Hail Atriði!